The natural beauty of lakes and coastlines won’t last without efforts to preserve them. When you’re out on the water, swept away in the grandeur of the great outdoors, it’s important to remember your actions come at a cost. If you aren’t careful, you could risk harming the environment you love so much. Fortunately, it’s easy to manage your emissions and waste when enjoying your boat. As long as you follow some simple strategies for green boating, you won’t pollute waterways or disrupt sensitive ecosystems with your hobby. It starts with an understanding of what you should and shouldn’t do. To guide you in the right direction, here are three tips to stay eco-friendly when boating. Keep this advice in mind as you move forward. Spills represent a serious risk to the environment. To place the problem in perspective, the volume of oil pollution and hydrocarbon entering North America’s waterways from recreational boating every year is more than 15 times the amount of the Exxon Valdez spill, if estimates are correct. So what can you do? As you fill your fuel tank, monitor its level and prepare to stop the pump when necessary. When dealing with portable tanks, fill them ashore to reduce the likelihood of spills, and collect supplies to prevent potential problems. An absorbent cloth can account any overflows, excellent to have on hand. When the subject of eco-friendly boating comes up in conversation, most skippers associate it with motor tuning and spill prevention. While these are essential to reducing your environmental impact, you also have to remain aware of invasive species. They’re just as deserving of attention as the other items on this list. If you trailer your boat between separate bodies of water, you’ll need to take the necessary precautions to account for extra passengers. Hose out the bilge, flush the motors and spray down the trailer and boat to attend to these stowaways. Otherwise, you could transport unwanted marine life without knowing it. You have a long list of green alternatives which can substitute store-bought cleaners, less expensive but no less effective. While non-toxic products are available, you’re far better off using your own homemade solutions to keep your boat clean. Here are just three eco-friendly cleaners you can mix yourself. Salt with lemon or lime juice creates a paste which works well for copper fittings. A mixture of one part vinegar and eight parts warm water can clean decks. Cream of tartar and water makes a solution for aluminum, applied with a soft cloth. This suggestion might seem like a lot, and it is. 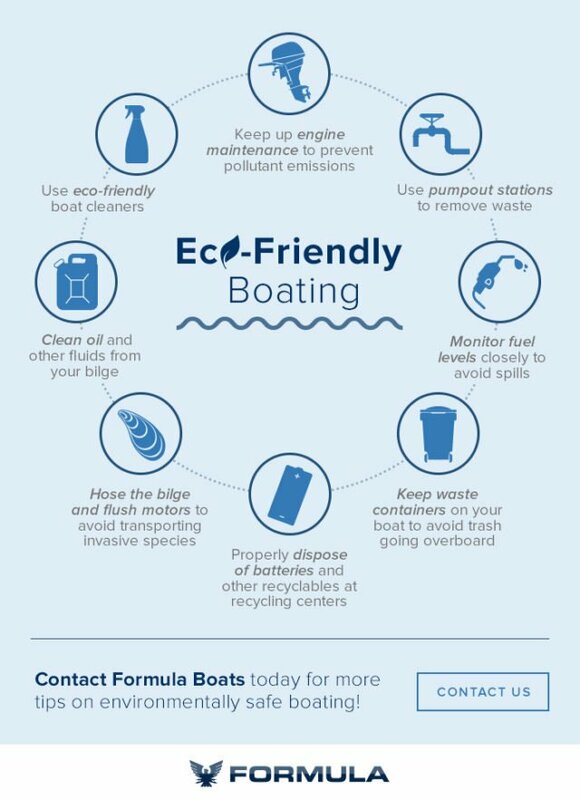 You’ll find many more strategies than we can include on this list, so to cover everything, here’s a helpful infographic illustrating the top tips for eco-friendly boating. As you move forward, reference these pointers. Remember some of the suggestions above the next time you’re out on the water. If you want to preserve the beauty of lakes and coastlines for generations to come, manage your fuel levels, check for invasive species and create your own cleaners. As long as you make an effort, you’ll make a difference.